It's man versus woman on the big screen. 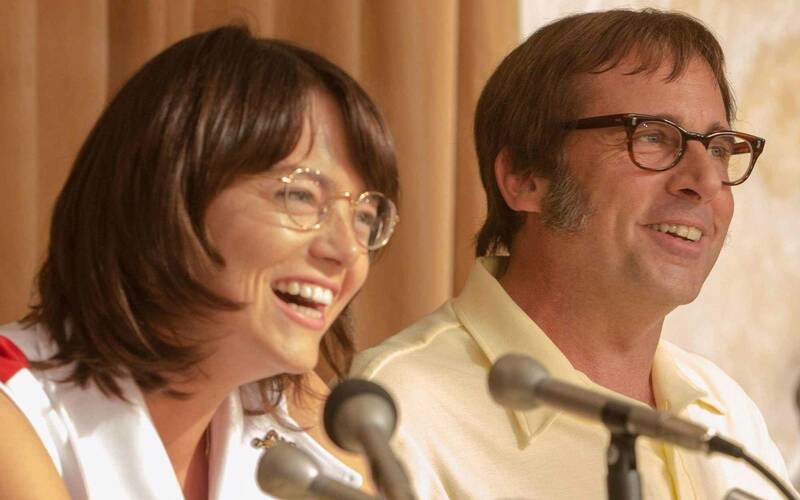 The film is based on the true story of the 1973 match between Bobby Riggs (Steve Carell) and Billie Jean King (Emma Stone). After finding out from lead US LTA (United States Lawn Tennis Association) promoter Jack Kramer (Bill Pullman) that the cash prize for women's tennis was to be eight times less than the men's prize—despite both matches bringing in the same amount of ticket sales—King, along with Gladys Heldman (Sarah Silverman), set up a women's tennis tour to directly rival the men's. After Riggs defeats Margaret Court (Jessica McNamee) by a landslide, it's up to King to prove that women deserve better, not only to self-proclaimed "chauvinist pigs" like Riggs, but also to the whole world. Along the way, both Riggs and King's personal lives begin to tatter at the seams—Marilyn (Andrea Riseborough) crashes into King's heart, while Riggs deals with the aftermath of a recent divorce. A misogynist tennis champion is challenged by America's best female tennis player in an unprecedented match—and the whole world is watching. Emma Stone is the highest-paid actress in the world. You've seen her in Easy A, Crazy, Stupid, Love, and The Amazing Spider-Man franchise alongside former boyfriend Andrew Garfield. Her latest and greatest performance was as Mia in La La Land, for which she received her first Academy Award for Best Actress. Steve Carell is most notable for his role as Michael Scott in The Office, but you've also seen the comedy king in The 40-Year-Old Virgin, Despicable Me (he's the voice of Gru! ), and Get Smart. This isn't the first time he's worked with Emma—they were in Crazy, Stupid, Love together. Sarah's a stand-up comedian whose latest special, A Speck of Dust, is streaming now on Netflix. You've seen her on Wreck-It Ralph, Bob's Burgers (she's the voice of Ollie), and The Book of Henry. Andrea is a British film actress—you may recognize her from her roles in Birdman, Oblivion, and Never Let Me Go. Bill made his acting debut in Ruthless People and went on to star in films like While You Were Sleeping, The Equalizer, Sleepless in Seattle, Independence Day, and Independence Day: Resurgence. Due to scheduling conflicts, Brie Larson was nearly sent in to replace Emma—thankfully, the issues were cleared. Prior to this film, an ABC docudrama titled When Billie Beat Bobby was released in 2001. The real-life Billie Jean King continues to support women athletes everywhere with contributions to the Women's Sports Foundation and the Women Who Lead initiative. Battle of the Sexes couldn't have been released at a more opportune moment, especially as we've reached a boiling point with regard to feminism and women's rights. The film is well-written and carefully wields the theme of women empowerment as its heart and soul, rather than a half-baked means to an end. King's ultimate goal—equality for women—is effectively channeled via athletic drive. As a result, it becomes the kind of feminism that's easy for skeptics to approach and understand. Steve Carell is fantastic as ever—his comedic scenes are just as compelling as his more vulnerable ones. Emma Stone wears the role of King like a glove, and her earnest line delivery and subtle facial expressions give us a feminist icon that doesn't evoke the "bra burner" stereotype. The real-life parallels are chilling, especially when you hear male characters (who are from the 1970s) say terrible things that we still hear in 2017. If anything, the film reminds us that women have come a long way, but that we still have a long way to go. Every man and woman who loves a good sports match and an underdog story. Female athletes will obviously love this, as well as anyone who wants to see Emma Stone once again at the top of her game (literally! ).